Walk-up Apartment Row-house built in 1875 within a block of the Historic District of Carroll Gardens. The renovation project redesigns the layout of all floors and replaces all plumbing, electrical and mechanical systems. Super-insulation and high-efficiency heating and water heating systems, combined with abundance of natural light minimize the two building's apartment units overall use of energy. The front facade brownstone layer is replaced and restored to original conditions. Project Role: Design Architect, Project Documentation and Construction Administration. Project Description: Residential Alt-1 with LPC filing, Renovation of Historic Two-family Brownstone Building. Project Elements: Super-Insulation, Energy Efficiency, Natural Lighting, Increased Level of Indoor/Outdoor Physical/Visual Connection, Utilization of Sustainable Materials, Indoor Air Quality Control, Construction Materials Related VOC Level Control, Wintertime Solar Heat Gain, Summertime Natural Cooling. Restored Stair, Post and Railing. Natural light and natural ventilation are increased with the use of operable skylights and a transparent south facing glass wall with transom windows. The wall includes glass sliding doors with thermal brake and a sun control device to block summer solar gain. The glass wall connects the kitchen/living room interior space with the block's neighbors courtyard creating a full “picture” of the historic gardens of Brooklyn. Custom furniture elements demarcate the space and use of the open plan living space layout. The rear facade transformation includes a steel/wood deck extending into the yard space that serves as an extension to the parlor floor and provides direct access to the garden/farm. The project is constructed using a green approach with environmentally sustainable materials and a strict level of control of construction related VOC content. Concrete paving is removed from the rear yard and the landscape is redesigned with new cedar fencing,seating and planters, spontaneous grass and minimal paving realized with bluestone material found on site after removal of concrete paving. A long custom built wood seating creates a space for relax and meditation. 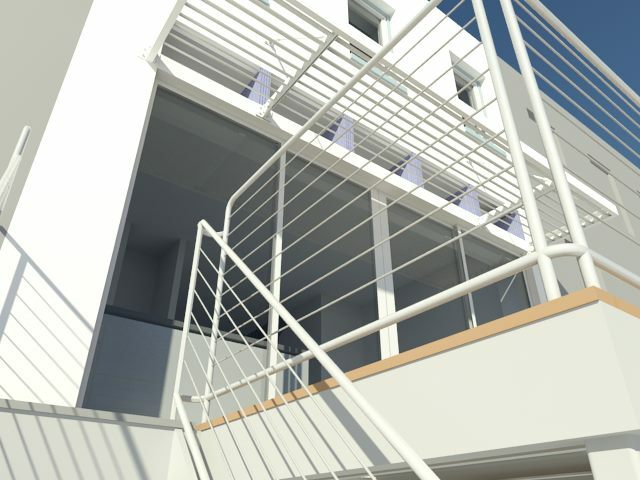 Design Development Renderings of the rear facade/deck with Daylight winter conditions.